Langston Hughes asked, in “Harlem”, what happened to a dream deferred. Whether it would fester or grow or change or harden, or sag, or even explode after a while. We can ask the same question about grief. 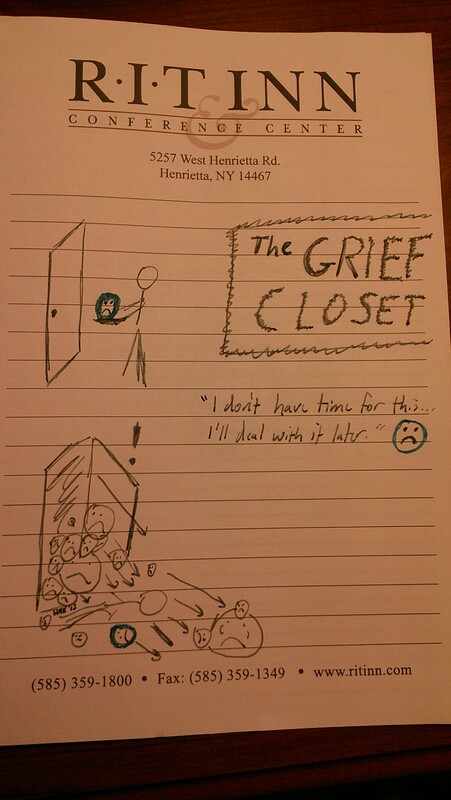 I learned the concept of the Grief Closet in a training session by Maureen Underwood, a social worker who’s done a lot of work designing suicide prevention programs for schools to use. It was one of those metaphors that perfectly explained its concepts, and I loved it instantly. 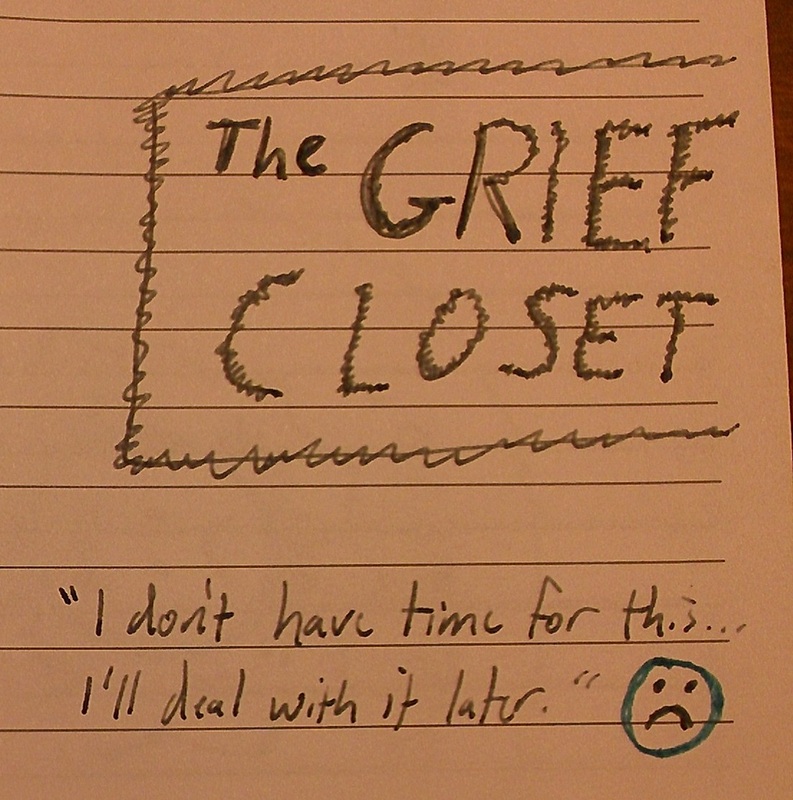 The Grief Closet comes up when we’re trying to understand why people are so unpredictable in their relation to crises. We’ve long observed that a given person can go through major trauma one week and seem fine, and then a seemingly minor thing happens later and the person breaks. What is it that’s so much more poisonous about the minor thing? Imagine a person, Alice, who’s pretty much normal. (Whatever that means). Alice goes about her daily life, sometimes happy, sometimes sad, just like most of us. On the day in question, something bad happens to her–something that causes her grief. Maybe she gets some bad news, maybe someone close to her dies, maybe she loses something important, whatever–something causes her grief. In an ideal world, Alice does her grieving right away. She participates in normal stages of grieving: maybe she pretends the grief hasn’t happened, maybe she tries to bargain with it, maybe she accepts that the bad thing has happened but suddenly feels really angry about the whole thing… normal grieving. Eventually, the grief recedes and takes its place within the larger context of her life. But what about those times when Alice has to just get through the present moment, knowing that she doesn’t have time to fall apart right now. Maybe she has young kids and has to get them fed and put to bed, or maybe she’s on a business trip and needs to represent her employer well. Whatever the reason, now isn’t a good time for grieving. But now Alice has a problem, because she has all this grief and she needs to stash it somewhere. She stashes it in the Grief Closet. Nothing. It’s normal. Everybody does this. We’ve got to keep our game face on, deliver good performance, and pay the cost later. It’s totally normal. Shove those problems into the Grief Closet, baby! After a while, though, what happens to closets? Unless you consciously go clean them out, closets fill up with crap. They’re natural collecting places for piles of stuff that doesn’t really belong anywhere, and they tend to perpetuate that state because closets have doors that shut. Out of sight, out of mind! So we forget about what’s in the Grief Closet. And why do we get those huge crises that come seemingly out of nowhere? Because sometimes when Alice tries to shove more stuff into the Grief Closet, the whole disorganized mess collapses, flooding out the door in an overpowering rush of pain, loss, grief, and negativity. When that happens, is it any wonder people struggle? Thanks to Maureen for the idea. I love the sketches! Thank you for sharing your ideas on this forum. I love to hear what you are thinking and the analogies that you are mulling over!